Aurora is a Home Rule Municipality in the U.S. state of Colorado, spanning Arapahoe and Adams counties, with the extreme southeastern portion of the city extending into Douglas County. 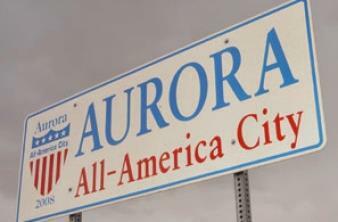 Aurora is one of the principal cities of the Denver-Aurora-Lakewood, CO Metropolitan Statistical Area (Metro Denver). The city's population was 325,078 in the 2010 census, which made it the third most populous city in the state of Colorado and the 54th most populous city in the United States. The Denver-Aurora-Lakewood, CO Metropolitan Statistical Area had an estimated population of 2,645,209 on July 1, 2012 (the 21st most populous MSA in the U.S.). However, Denver and Aurora combined make up less than half of the Denver Metro Area's population and Aurora has approximately half the population of Denver. The estimated population of Denver-Aurora, CO Combined Statistical Area was 3,214,218 on July 1, 2012 (16th most populous CSA).